I never would have thought this would be something I posted, but a friend was pretty excited when she saw these, so I thought it might be worth posting about it. I’m going to BEA this year, mostly as a birthday present to myself, an excuse to visit my two favorite cousins, to see the Lorca exhibit at NYPL, and to see a show on Broadway with my mom (it’s on her bucket list and while I’ve seen one before, she hasn’t, so I’m happy to oblige). I also thought it’d be a fun chance to meet a few bloggers and publishing professionals, pick up a couple of ARCs I’ve got my eye on, maybe get a book signed. I’m also excited to browse forthcoming YA novels with the idea of looking for the midlist titles and hidden gems because those are the kind of books I’m most interested in discovering (and promoting on this blog and in the library). 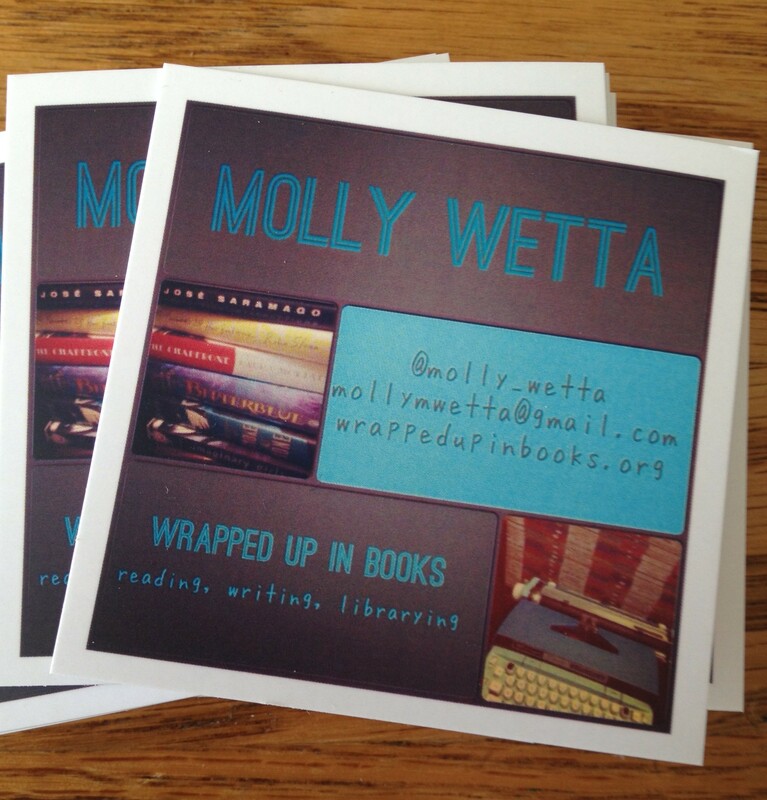 I read on a couple of posts that it’s a good idea to have business cards for your blog when you go to BEA. I kinda liked the idea of having business cards. I’ve only recently started to get comfortable with the idea of promoting my blog (or even letting people I know in real life even know about it), and business cards seemed like a way to make that official. But when I looked at a couple of the business card sites various blogs recommended, the designs all looked cheesy and forgettable. I didn’t want to spend a lot of money, and anything that appealed to me started to get pricey. I was kind of bummed, because I wanted to have cool “business” cards. Then I glanced at my craft desk, where a stack of lovely printed Instagram photos sat, and I had an idea. Using my iPhone and a few free apps, I created my own. I’m not really a designer, but these fit my style better than anything else I could find and were at the right price point for me. Phonto allows you to add text to photos or to just add text to a plain background. I use it to create the header and images for features on my blog, so the fonts and colors I used for the cards match. I made one image with my name, one with my blog name and tag line, and one with my twitter handle, email, and blog URL. I choose two photos I’ve used on my blog to add and compiled the text and images in a collage using InstaCollage. I used a filter in Instagram, then printed them through Prinstagram, a site I had previously used to print photos and loved. You can get 48 2.5 x 2.5 inch prints for $12. I went ahead and ordered a double set and all my Instagram photos I wanted prints of from the first few months of the year and paid the flat $7 shipping rate (which I would have paid at some point to print my photos, so I’m not counting in the cost of my “business” cards). So for $24, I got 96 business cards. I’m rather shy and can’t imagine chatting up so many people that I need more than that, and I wasn’t sure how they would turn out or if the type would be big enough, so I didn’t want to want to go overboard and order a huge quantity. I think the 2.5 x 2.5 size makes them stand out from traditional business cards. There’s plenty of room to write my mailing adress on the back if I want to share it with a publisher. They are sturdier than most business cards. The quality of Prinstagram pictures is really lovely, so even if you don’t want to make business cards, if you’d like prints of your Instagram photos, I’d highly recommended the company. They offer a variety of products and ordering on their website is much easier than trying to navigate the photo centers on the website of any big-box retailer or drugstore. You don’t have to upload your photos because they’re already on Instagram, you just click on the pics you want, and bingo! you’re done. Do you have business cards for your blog? Are you going to BEA? Hi there! I know this is an old article, but I found it through Google while looking into ideas for business cards for my book blog. I’m fairly shy as well. Do you mind my asking how you did with mentioning your blog to publishers/strangers and giving out your cards? Was it harder or easier than you’d anticipated? At BEA, I didn’t get that much mileage out of them. I went to the book blogger conference (which was a huge waste of time, although better than I heard this year’s was) but didn’t really meet any new bloggers that I clicked with, and bloggers I already interacted with didn’t need a business card. I prefer to read galleys on my Kindle, and because I’m a collection development librarian, I’ve never been declined for a netgalley/edelweiss request. So it’s only for books that don’t have digital galleys available that I care about getting a paper copy of it. For the most part, the publicists and marketing people in booths didn’t have time to actually *talk* about books. I remember repeatedly asking for diverse/LGBTQ titles and meeting blank stares. I only gave my card to one publicist because I wanted a copy of a book for an article I was writing about for YALSA and they didn’t have any. I never got a response. My cards have mostly been helpful to give to people when I present at library conferences, since I post slides and further information and links and such on my blog. I guess, for me, I’m much more comfortable promoting my blog and interacting with people when I’m wearing my “librarian” hat as opposed to my “book blogger” hat. So, I guess it has gotten easier. I’ve redesigned my site and am much more happy with it, and I feel like I’ve found what works for me on my blog as far as content and voice. I’m much more comfortable talking about it now. Basically, I was forced to when I had some more high profile coverage (like NPR) link to it. I hope that helps? For what it’s worth, I’m going the prinstagram route for my next batch, not that they offer double sided prints, and I’ve figured out how to better design them and will match them to my updated site. Oh, gosh, you replied to me last year and I never thanked you for that! So sorry; not sure how I overlooked your response, but I stumbled upon it again while looking into cards for this year. Thank you for taking the time to explain the ways you’ve used your business cards. I do prefer print ARCs whenever possible, so there’s that, I suppose. And there’s always the possibility that I’ll be outgoing enough to chat with a few fellow bloggers. (It might be optimistic of me, but it’s nice to think of multiple uses.) I also occasionally review independent bookshops, and I’d love to leave a card with the shop owner so they can check out my photos and write-ups. You’ve given me lots to consider; thanks again! These do look great, Molly! Honestly, I had business cards printed up last year and found it to be a waste of money–I wish I’d just made my own. I didn’t really use them, because as a pretty quiet/shy type person, I mostly just talked to bloggers I was already friendly with online. I’m bringing them again this year though! I hope I get the chance to meet you. Are you going to the BBC on Wednesday, or just BEA? I’m pretty shy too, which is why I didn’t want a ton. Or to spend a lot of money. But I didn’t want to be the uncool kid without them, either! I am going to Wed BBC (though i found out belatedly they have a librarian day too, and wondered if it would be better) and I will definitely look for you! These look great, Molly! I can’t wait to hear how your trip is. I hope you get to do everything on your list. That is a really nice idea!! I still need to make business cards and I keep forgetting AHHH! That’s a really great idea. Have fun at BEA! I hope to go there next year (fingers crossed).